Small Batch Home Canning. Yes, you can! Does the word “canning” evoke images of vats of boiling water, bushels of produce and rows of jars? If so, you don’t know small batch canning! Small batch canning is easy, safe and requires only a few inexpensive, simple pieces of equipment. In fact, you probably already own most of what you will need! There are two methods of canning: water bath and pressure. Water bath is safe for high-acid foods such as pickles, chutneys and jams. Pressure is safe for low acid foods such as meats, stocks, and low-acid vegetables (i.e. corn, beans). Let’s talk about water bath canning. My “Preserving The Harvest. Small Batch Canning With Tess” class is now live. In my small, hands-on class, I will take you through the process from start to finish. During class, you’ll graze on an assortment of goodies prepared with the recipe you are learning to can that day and accompanied by lots of sparkling wine. At the end of class, you’ll leave with your own jar of preserved goodness plus access to the recipes. If there isn’t a class scheduled at a time that works for you, request one! I will to my best to accommodate you. Small batch preserving is not only easy, safe and satisfying. it’s also economical and environmentally responsible. Jars are reused rather than being thrown away. Children are fascinated with canning. Preserving with children teaches them the values of thriftiness and environmental responsibility, plus it’s just plain fun! Don’t forget that home canned goods make great gifts, too. There’s no feeling quite like admiring your own little stock of home canned goods. I hope you will allow me to show you how simple it is to make small batch preserving a part of your life. Mint is one of the easiest, most pleasurable herbs to grow. It’s perfect for patio gardens as it is both ornamental and functional. It’s also a perennial in most climates. 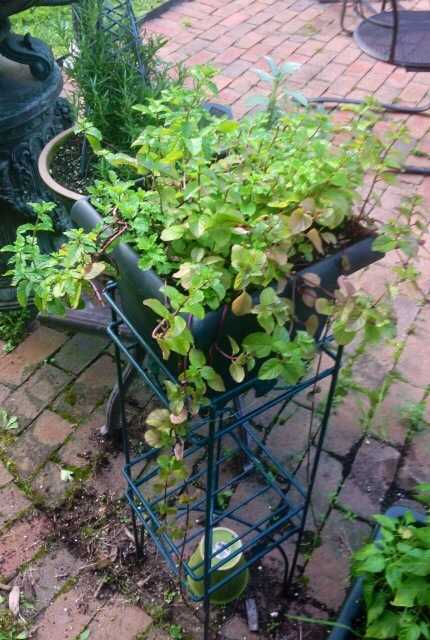 Because mint is very hardy and invasive, it should only be grown in containers. Learn more about growing mint here. 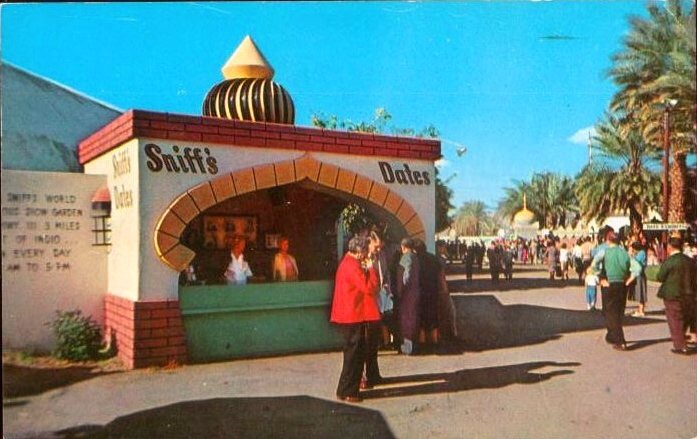 Mint comes in several flavors such as apple, orange and ginger. One my favorites is chocolate mint both for its flavor and appearance. Here, chocolate mint trails beside standard mint in my mint pot. I love to place mint stems in small vases on windowsills and in bathrooms. Paired with lavender and rosemary sprigs, they make a lovely, aromatic display. In my kitchen, herb bouquets stand ready for culinary use. 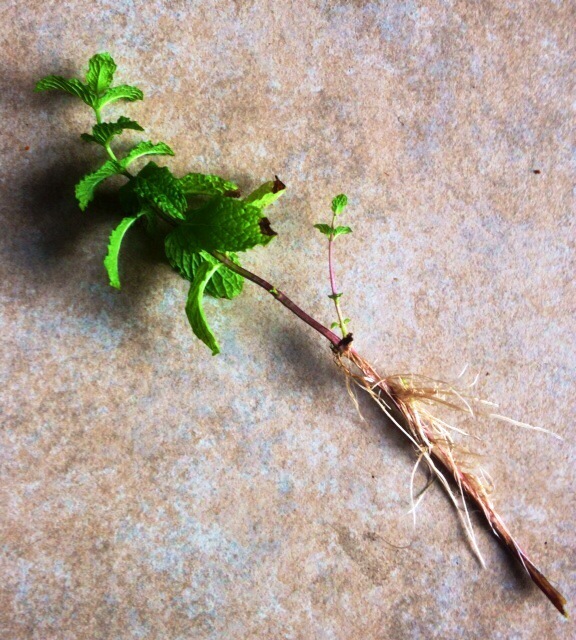 As a little girl, my mother showed my how easy it is to root mint. Simply place a small vase of mint sprigs in a sunny window. In a week or two, your sprigs will have roots. I was always so amazed at this. I still am! If you have little ones about, they will be fascinated with the process. 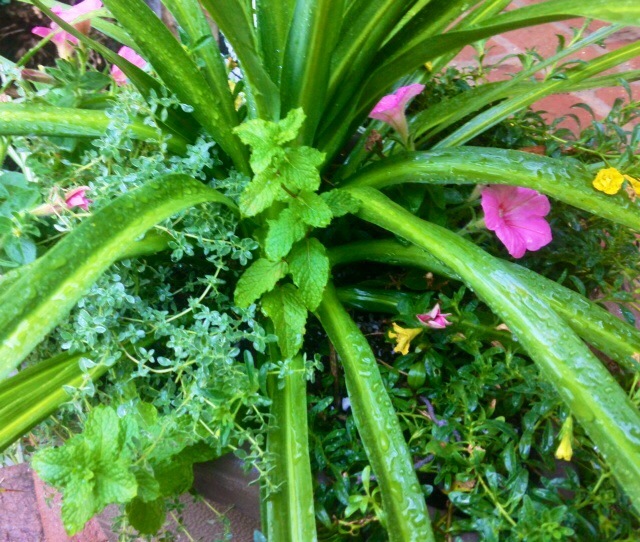 Once your sprigs have a nice set of roots, simply pot them, give them some water and voila! A new mint plant. 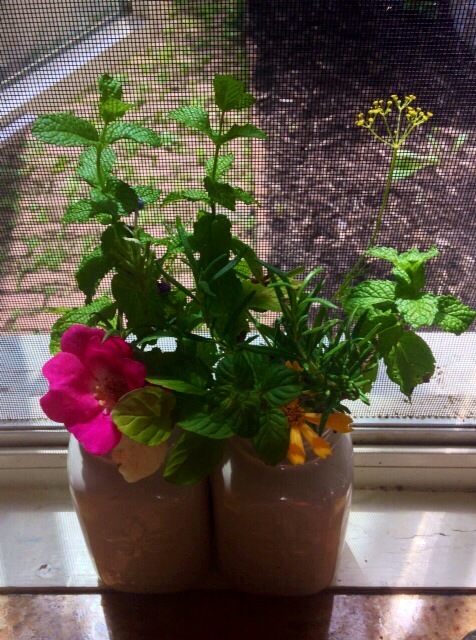 I like to repurpose pots and containers by planting mint sprigs and giving them as gifts. I use rooted sprigs to replenish my own mint pot. As the summer wanes and my annual pots start to look a bit bedraggled, I often perk them up with mint like this patio container. August is not the time most of us are thinking of starting new plants, but mint can be started any time. 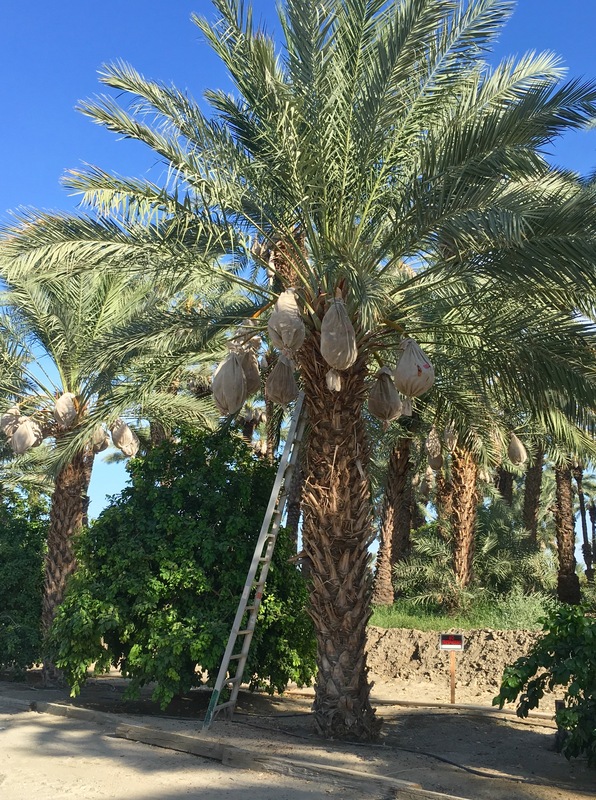 It will thrive outdoors until the first hard frost, and can be grown inside as well. Learn more about cultivating mint indoors here. There are many uses for mint. 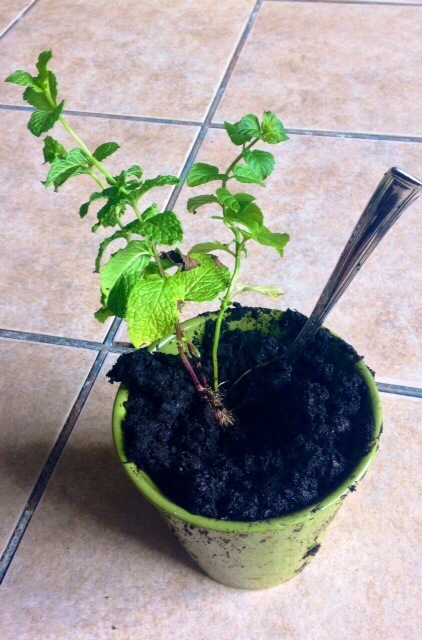 Once you have your own mint pot, look for ways to enjoy it. Some of my favorite recipes are Yogurt Mint Sauce, Strawberry, Mint and Black Pepper Jam and The Tranquillo, an absolutely delicious cocktail. Of course, we can’t forget that Cuban classic, the Mojito. You can usually find mint plants at your grocery store. I get mine at Trader Joe’s. Pick one up and, like me, you will fall in love with mint! Here in Ohio, summer is at its peak. Tomatoes grow exceptionally well in Ohio. A visit to an Ohio farmer’s market in July will reward you with lots of tomatoes to choose from, often including heirloom varieties such as the yellow tomatoes pictured above. The flavor of fresh tomatoes is one of the best arguments for eating seasonally. Because tomatoes are highly acidic, they can be canned in a water bath. So easy! Learn more about canning tomatoes here. One of the easiest herbs to grow is basil. Basil does exceptionally well in containers, loves the sun and grows quickly throughout the summer. 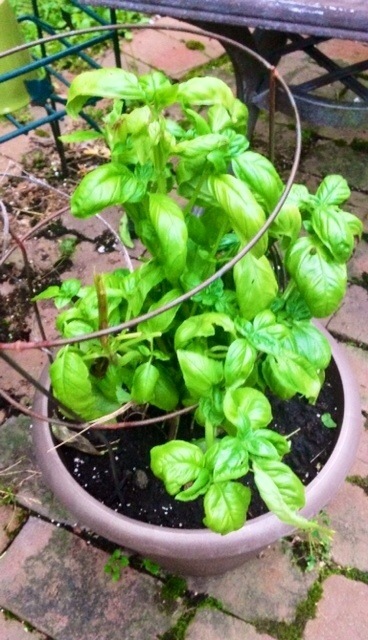 One large plant (like this one in my container garden) will keep you supplied with fresh basil throughout the summer. Plant an extra one or two and you’ll have basil to make pesto too! Pesto cannot be safely canned at home, but it does freeze extremely well. If you are freezing the pesto, omit the cheese as it doesn’t freeze well. You can add it after you thaw the pesto. Learn how to make pesto here. Plant some basil and discover for yourself the taste of your own fresh picked basil. Basil plants are often available at your grocery store. Now for the Perfect Summer Salad! We’ve all had that most traditional of Italian salads, the Caprese. Made with just four ingredients…tomatoes, mozzarella cheese, basil and balsamic reduction…the Caprese comes into it’s own at summer’s peak when the freshest tomatoes and basil are available. 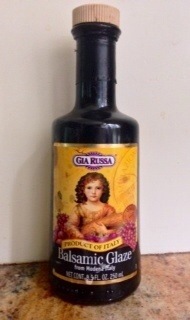 You can reduce your own balsamic vinegar. Find out how here. It will take a few hours and must be watched closely to prevent it from over reducing. I find it much easier to purchase a prepared reduction. I particularly like Gia Russa. -Slice your tomatoes into approximately 1/2″ slices. Spread the slices out on paper towels and sprinkle lightly with salt. Let the tomatoes sweat for 30 minutes. -While the tomatoes are sweating, pick and rinse your basil. Pinch the the leaves off the stems and set aside. Slice a log of fresh mozzarella in 1/2″ slices. -After 30 minutes, arrange the tomatoes on a platter and sprinkle lightly with salt and pepper. Tuck the mozzarella slices and basil leaves in between the tomato slices. Drizzle balsamic reduction over all. And there you have it! Summer’s Perfect Salad. Making jam, “confiture” in French, is a beloved tradition in France. When Americans think of canning, they often picture steaming stockpots, pressure cookers and rows and rows filled jars lining the pantry shelves. I know that’s what I thought! In France, it is quite common to can just one or two jars of confiture. Fruit is selected at the peak of ripeness and cooked with cane sugar, pectin, and a little lemon juice in a copper pot. Being high in acid, jams can be canned in a water bath which is safe, easy and doesn’t require lots of complicated equipment. Here is a great water-bath canning how-to. I often make just a few jars of jam. 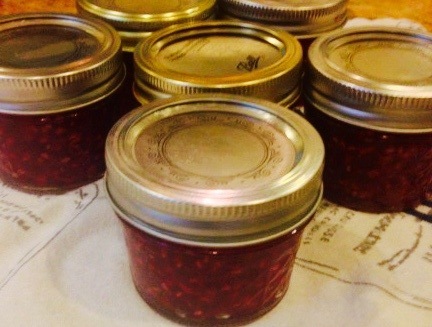 Last week, I made one of my favorites… Raspberry and Rosé Jam. You can find the recipe here. 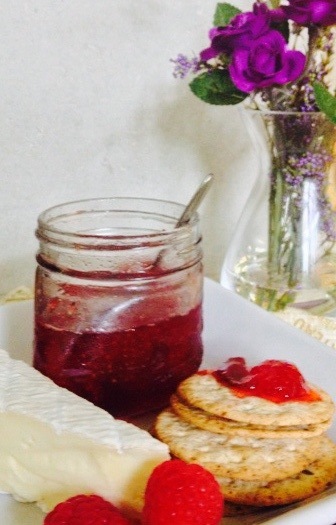 Strawberry, Mint and Black Pepper Jam is another traditional recipe I love. Mint is one of the easiest, hardiest herbs to grow, and I’m always looking for ways to use it. Don’t be put off by the black pepper. The amount is small and you actually don’t taste it; rather, it offsets some of the sweetness of the strawberries and brings out the mint. You can find the recipe here. Of course, fruit tastes best when fresh and in season. 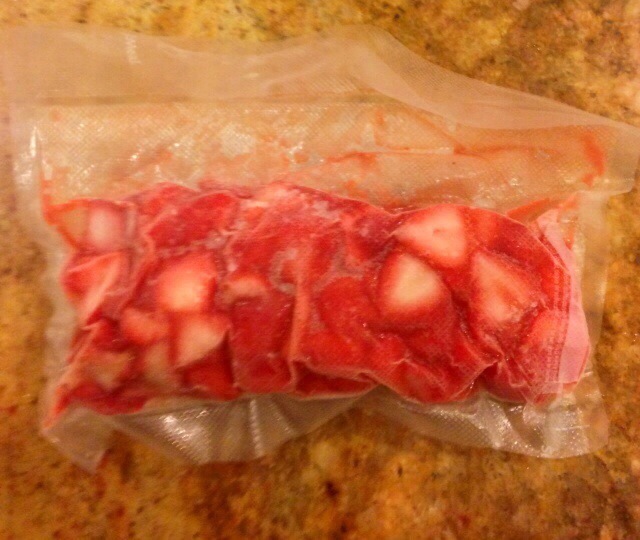 When I see something fabulous I want to make into jam but don’t have the time, I vacuum seal and freeze it. Canning and vacuum sealing are my best friends when it comes to eating locally and seasonally! I just made a batch of jam using frozen, vacuum sealed strawberries. If, like me, you’re not putting up an entire pantry full of canned goods, you don’t need an industrial strength vacuum sealer! I have owned two Food Saver brand vacuum sealers over the past 20 years. Here is my second, current one. They are affordable and the customer service is excellent. Get one and it will soon become your best “eating seasonally and locally” friend, too! Here is one last reason to make jam. A jar of jam makes a wonderful gift. Beyond being delicious and pretty to look at, they are personal. Recipients truly appreciate the care that goes into making them.